The Christmas Reindeer Hat is a furry animal hat that sits atop your head with mistletoe and a grin. This hat is available in One Size Fits Most Adults. 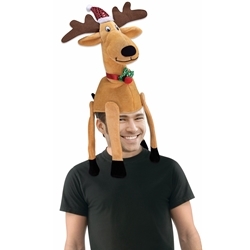 This happy Reindeer Hat has a Santa hat on top, and mistletoe around its neck. The hats legs dangle about – it’s hard not to spread holiday cheer when wearing the Christmas Reindeer Hat!